In terms of the world today, Morocco is considered a safe country. In fact, the crime rate is very low. Morocco stands committed to dedicating significant resources to counter-terrorism intelligence, both on the national and international levels. The Kingdom of Morocco is stable politically and receives more tourists than any other African country. Of course, every potential visitor must use his or her own judgment regarding traveling to anywhere in the world. We at Open Doors consider Morocco a very safe place to be not only for ourselves, but for our families. Our host offered information on what was safe to do, what to avoid and how to avoid being taken advantage of. Deb K.
My three friends and I, all females, felt safe and secure at all times. Adriana P.
Do I need certain vaccinations to enter Morocco? Morocco does not require specific vaccinations. However, it’s always a good idea to ask your primary care physician for his or her opinion. The Moroccan ability is switch languages is unparalleled. It’s not uncommon for three languages to be represented in one sentence! Morocco has two official languages: Arabic and Berber. Moroccan Arabic (Darija) is what majority of people use in everyday interactions. There is no written form of Darija, although it can be spelled using Arabic letters. Street signs are in Classical Arabic. French is the language of business, the government, and higher education. French is considered a 3rd “unofficial” language of Morocco. In the north of Morocco, Spanish is spoken due to the proximity of Spain. English is becoming the second foreign language of choice among educated youth. If you hold a passport from the US, Canada, Australia, Europe, New Zealand, China, Malaysia, or Singapore, as of the writing of this documentation, you do not need a visa. Those from another country not listed may or may not need a visa. It is always good to to check with your local consulate office to determine the facts. Regardless of visas, Morocco requires at least 6 months of validity remaining before the expiration date on the passport. They also require one blank page for the entry stamp. What type of tourism does Open Doors Morocco offer? We are a full service operator focused on private individual and group tours. We specialize in photography tours as many of our local hosts are amazing photographers. We book standard, comfort, and luxury accommodations where available. All of our partnerships have been personally inspected by one or more of our team. We strive to develop and maintain ethical working relationships with all local suppliers. We strive to remain at a distance from the “mass tourism” that plagues many countries, including some areas in Morocco. We prefer to offer organic, sustainable, and culturally authentic tours that offer our guests amazing cross-cultural experiences while they explore the beautiful country of Morocco. Our goal is to offer more than just a vacation, but an experience that will be remembered for a lifetime. Because we do not conceptualize your tour as a check list of services, please note that we do not offer a cost breakdown with our quotes. The geography of Morocco is such that all throughout the year there are locations where the climate is mild. For instance, during the summer months when it is extremely hot in the interior of the country, the coast is a cool respite. Summertime is the best time to hike and explore the higher altitudes of the Atlas mountains. In winter, the Atlantic coast is warm. The desert is very hot in the summer, but pleasant at other times of the year. Do You Charge an Itinerary Planning Fee? No, we will work with you until you feel comfortable and excited about your plan. How Does Open Doors Morocco Determine Pricing for Tours? Like the old adage says, “You get what you pay for.” We have no interest in being the cheapest tour in Morocco. You receive an excellent value and return home with amazing memories and new friends in Morocco. Our tours are not cookie cutter, one size fits all tours. While we have example itineraries on our website, everything is customized. Because we put a great deal of focus on each of our tours, we limit the number of bookings at one time. This enables us to build great individualized itineraries and match people with our excellent hosts. We do not compromise on the quality of our local hosts. We believe in paying our local hosts fair living wages. This is also something we will not compromise. One of the primary reasons we started Open Doors Morocco was that we saw the disparity in the tourism industry here. In most cases, the locals work the hardest, yet are compensated the least. The majority of Moroccans working in the tourism industry are not able to support their families on their income. At the same time, we won’t compromise on the expectations we lay out for our hosts. We have high standards for our local hosts and they rise to the occasion because they love their jobs and engaging with their foreign guests. You can read an outsider’s review on our vision by visiting Sixnie and Salt: Ethical Tourism: What is it? And Why Should You Care about It? Please note that we do not offer itemized cost breakdowns. The company is certainly not the least expensive option, but it is very, very, very much worth it! Emily D.
Why is it Better to Book with Open Doors than to Travel Independently? There are many reasons to select Open Doors Morocco for your Morocco vacation. First, our primary goals are to create amazing experiences for our guests, while relating ethically with the Moroccan nationals. Those who choose to travel independently in Morocco, stand to miss out on many things that can only be experienced with a local host. We prefer to use the term, “host” rather than “guide” because they are far more than guides. Your ODM host is the touchstone between you and the Moroccan culture. They love introducing guests to their country and being involved in cross-cultural experiences. You will have the opportunity to meet some very special Moroccan people as you travel throughout the country simply because you are with a Moroccan. Depending on where you are in the country, we may hire an additional guide. For instance, we always hire a guide in the city of Fes. The Fes Medina is a labyrinth and it requires a guide who is licensed specifically for the Fes Medina. We have never used a guide in any of our travels, but this was the only way I could talk my husband into this trip. I’m so glad we did. We would not have been able to navigate on our own and see as much otherwise. Vicky L.
Secondly, traveling with us enables you to forget about the details. We will handle everything from touchdown to departure. Finally, at Open Doors Morocco we believe in paying our tour hosts a thriving wage. We don’t pay our tour hosts peanuts for their knowledge and expertise. They are passionate about their work and sharing their country with others. The work hard and should be adequately compensated for their work. This is unusual in the tourism industry and it’s something we don’t compromise on. What Types of Accommodations Do You Use? We do not book in the large “cookie cutter” hotels unless specifically requested. We use accommodations with a Moroccan style that we know personally and have been rated by our guests as excellent. That said, there are various levels of accommodations in Morocco. We will book Standard, Comfort, or Luxury accommodations. Depending on your location, luxury is not always available. Standard accommodations are clean and simply decorated, yet still beautiful. Comfort (or Superior) accommodations are slightly more plush. Finally, luxury accommodations are the most plush. In addition to traditional accommodations, we also offer home visits in various parts of the country. These home visits are available for those wishing to experience life in a Moroccan home. Our home visits are well vetted. Some people like to stay in a home visit for 1-2 nights out of their trip. Staying in a home visit is one way to help the local economy. It’s also a sure fire way to make sure you are pampered and spoiled while you are there. Moroccans are amazing hosts! The care that this company takes in preparing customized itineraries that accommodate all manner of needs/desires (my partner is an above-knee amputee) is impressive, and resulted in great experiences for us. 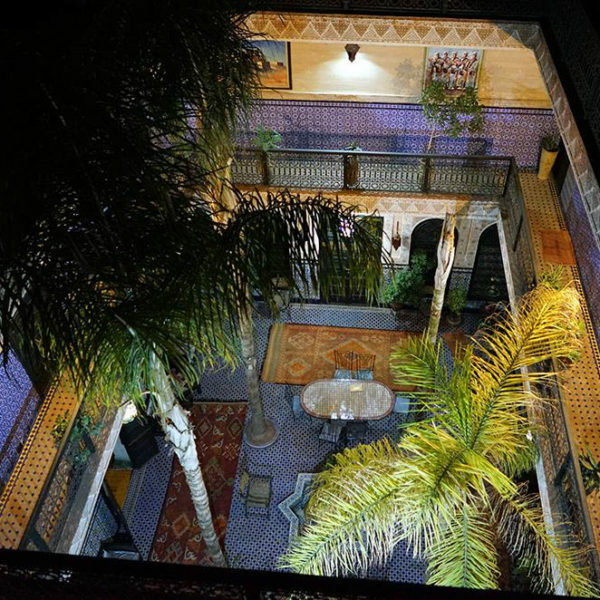 Rosemary Y.
Riads are traditional homes in Morocco, usually found in medinas (the old cities). Many have been turned into small, intimate hotels. They are characterized by an inner courtyard or garden as the central element of the building. The courtyard is open air with the rooms situated around the courtyard. The courtyard is on the bottom floor and the rooms rise 3 – 4 floors around the courtyard. The rooftop is usually set up as a terrace for relaxing and meals. In keeping with the Islamic idea of privacy, riads do not have large outward facing windows. Instead the rooms have windows facing the opened courtyard. From the outside most riads have simple doors. Upon entering the riad, you find yourself in a beautifully decorated palace, or sanctuary, hidden away from the hussle and bussle of the busy medina. Absolutely! We love having kids along. You’ll find that children are loved and cared for in the Moroccan culture. Your children will love Morocco. It will be a vacation they’ll remember for a lifetime. Morocco is very family oriented. Bringing your children along may be an advantage for engaging with locals, as Moroccan society is very child friendly. Our kids gained a great appreciation for the different lifestyle and the country. Amy S.
How Much Time Do I Need in the Country in Order to Experience the Sahara? There are few words adequate enough to describe the wonder of a visit to the Moroccan Desert, especially when your host was a Nomad who grew up calling it home. Deborah K.
To visit the desert, you need a minimum of three days, four is better. In fact, a desert trip wrapped up into a longer tour is the best way to see it. There is so much to experience that it’s difficult to process in a short time period, especially since the desert is far from the primary tourism cities. As a word of warning, now and then someone will come to us asking to see the “Marrakech Desert” just an hour outside the city. There is no desert directly outside Marrakech, and any tour operator who tries to sell you a tour to the Marrakech Desert is lying to you. The “Marrakech Desert” consists of hills with dust on them. Additionally, if you run across a tour for $100 – $200 USD, you would be wise to ask questions. It’s impossible to operate a private tour for this amount of money. These types of tours are those that will take up to 17 people per vehicle, and in our opinion is not the best way to experience the desert. A private tour, in a high quality 4×4 with the capability to drive off-road is the best means of travel for this adventure. In addition, when the vehicle is driven by an experienced ODM host, who not only has been to the desert once or twice, but grew up in the desert, your experience is so much richer and authentic. It’s similar to the difference between hiring someone from Delaware to take you on a tour of California and hiring someone born and raised in California to lead you. In other words, how many times in your life will you get to see the Sahara Desert? What about Photography in Morocco? Please always ask permission before photographing someone. Your host will help you with the language barrier. Many Moroccans, especially those in smaller cities, villages, and rural areas do not wish to be photographed. In fact, many consider photographs of themselves to be forbidden by Islam. Many travelers have posted photos of Moroccans on Facebook and other social media without permission. This is understandably uncomfortable to those in the photos. We recognize that the Moroccan people are very photogenic, however they are real people with hopes and beliefs, not exhibits. We ask that you approach photography with empathy and respect. Our rule of thumb is that if the person’s face is easily identified, their permission should be granted before posting. Our hosts are specialists when it comes to photography as we work with many photographers. They can help you as you navigate photography and the Moroccan culture. For avid photographers, we can arrange photo fixer experiences for you to ensure that the Moroccans are accepting and you shoot great portraits. Photographers Take Note! Personal, Professional, and Original with a focus on Cultural Awareness and Sustainability Laura H.
Can You Connect Us with Cooking Classes? Absolutely, we can do this. Mention something to us during the tour planning and we will make suggestions based on your specific itinerary. In Marrakech, we work closely with Creative Interactions. Creative Interactions offers many interesting workshops that provide various levels of introduction to the Moroccan culture. We’ve had many guests take advantage of their workshops that typically last 90 minutes to 3 hours. It’s amazing how much preparation for the rest of the tour can be wrapped up in these short sessions. People walk out with more confidence in greeting the culture and asking simple questions such as, “Where is the bathroom?” We can make the arrangements for you with Creative Interactions. Just let us know if you are interested. Do I Need Trip Insurance Before Traveling to Morocco? We do not require that you hold trip insurance, but in the day of modern travel it is always a good idea. We recommend that for peace of mind, you purchase cancellation, interruption, and medical insurance that covers you during travel. These policies can be purchased for minimal money. How Should I Pack for Morocco? How do I prepare for my stay at the desert camp? The camp is quite comfortable. There is running water, toilets, and a shower. The tents have double beds or twin beds, depending on the composition of your party. All linens are provided. Do not worry, you will not be paired with strangers! You can climb the dunes as high as you like to watch the sunset. Afterwards, there’s dinner and music around the fire (depending on weather). Night photography in an isolated unlit area is possible – please ask for more information. You’ll want to have batteries fully charged. Should I Exchange Money Before Traveling to Morocco? Morocco’s currency is the dirham. For the most part, Morocco is a cash country. Plan to use cash, and be pleasantly surprised when you find opportunities for credit cards. It is possible to order the Moroccan dirham from your bank prior to travel. However, this is not necessary and is usually more expensive. There are ATMs all throughout the country. Also, your host will be happy to take you to a money exchange cashpoint that will give you the best deal. We do not recommend using the ATMs or the the exchange counters in the airport as you will pay a higher exchange rate. If you are an American citizen, the bank Charles Schwab, offers an excellent checking account. They do not charge any foreign fees on purchases or ATM withdraws. If you are charged for using a foreign ATM, they will refund the charge to you at the end of every month. It is good practice to notify your credit card companies and / or bank as to the dates of your travel to Morocco. Traveler’s checks cannot be used in Morocco. Although Morocco is a Muslim country, there is generally a liberal attitude toward foreign use of alcohol. In fact, Morocco produces good wine and even a few popular local brands of beer such as Flag and Casa. Alcohol is not served or available for purchase inside the medinas, or nearby mosques. You’ll find that some cafes and restaurants in the new parts of large cities will serve alcohol. Likewise, there are often bars in large hotels. Most riads and smaller hotels aren’t licensed to sell alcohol. But many of them allow guests to bring alcohol in to be consumed. We can always check with your specific accommodations to determine their policy. Most large grocery stores sell alcohol in areas that are sectioned off. Alcohol shouldn’t be consumed in public areas and intoxication is highly disapproved. It is illegal to carry open containers in public. Can I drink tap water, is it safe? We do not take chances and ensure that you have access to bottled water at all times. Water used for tea and coffee has been boiled and is considered safe to drink. How Do I Keep from Getting Sick? Our guests rarely have issues, although some have had some mildly upset stomachs, probably due to adjustments. We recommend only eating cooked vegetables or fruits that are peeled so that you don’t eat food washed in tap water. In some locations the fruits and vegetables are washed in bottled water. In that case, it is safe to branch out. Your host will be able to check all of this out for you. What Type of Electrical Plugs / Voltage Should I Have When Visiting Morocco? The electrical plugs in Morocco are the same as in Europe: 220 volts AC, 50 Hz. If bringing devices from the US, UK, Australia, and South America you will need adaptors for two-pin European plugs. These can be purchased prior to arriving in Morocco. They can also be purchased in Morocco. How Does Tipping Work in Morocco? Because tourism is such a large part of Morocco’s economy, tipping is regular practice in the country. To alleviate search for small change, we offer a tipping caddy. You can pay into the caddy and your local host will use those funds to pay the hotel, city guide, camel guide, and luggage porters for you. The tipping caddy doesn’t include the tip for your local host. We leave that up to you at the close of the tour. If interested in this service, just ask at the time of booking. Upon booking, we will provide you with some good rules of thumb for tipping. As a note, it’s expected practice to tip the “keeper of the bathroom” around 2 dirhams when using the facilities. However, if the bathroom is not clean or stocked with toilet paper, do not feel you need to pay a tip. Wifi is widely available, yet spotty. We recommend coming to Morocco with an unlocked phone. Most US phone companies will unlock Smartphones to enable international travel. Upon arrival, you may purchase a Moroccan SIM card for around $5.00 USD. This will enable you to have data on your phone. A combination of wifi and data will keep you on-line pretty consistently. You can easily pay-as-you-go as top up cards are widely available. There are three phone, text, and data operators. We can help you determine which to use depending on where your tour is within the country. If you have an unlocked phone, you can purchase a Moroccan SIM card. This is what we recommend. A SIM card costs approximately $5 USD. Once you have a SIM card and some data (approximately and additional $5 USD) you will be able to use Whatsapp, the Internet, and other web apps. You should also be able to use your phone as a hotspot as long as you have connectivity. There are three phone companies serving Morocco. The best company to use is Orange as it has the most coverage. Your local host will help you get set up with this. If you are from the US, we recommend getting a Google Talk number before leaving. You can provide that number to those in the US. As long as you have access to the Internet, they will be able to reach you by calling the local US number you select when you set up your Google Talk account. The same is true for Whatsapp. However, the Google Talk number will enable people who don’t have Whatsapp to call you in the same manner as they would in states. What if My Luggage Gets Lost? First, remain calm. Secondly, it’s a rare occurrence, but it has happened occasionally, especially if rerouted at the last minute. If you land in Marrakech you will want to go to the “lost luggage room.” This room is a small door across from where you entered the baggage hall. It’s near the restrooms. There is a small desk in there with a man behind it who will take your information (your baggage claim tickets are important here.) He will find your luggage – more than likely it is still hanging out at your last stop. He will tell you when you can expect your luggage to arrive, usually the next day. He will give you a piece of paper with a phone number to call before returning to the airport to retrieve your luggage. Your local host will help with this the next day. If you have trouble understanding the man behind the desk, insist that he call: 0672085113 and allow you to talk with Said or 0661338955 for Habib. They can help translate for you. Sometimes the airport has wifi. In that case, you can whatsapp Nancy at +212 698753564. Again, this is rare, but we want you to have the information just in case. Hint: If there is more than one in your party and you’ve waited for quite awhile for your luggage, we recommend sending one person in the party to the “little door with the man behind the desk” as mentioned above. The other person should keep watching for the luggage. We mention this because once the line forms outside that door, it can take quite some time to get everything arranged. There is usually only one person behind the desk and it is not a quick process. If you land in Casablanca, you should look for your airline desk after you’ve found that your luggage did not arrive. From the time Habib met us at the airport, I felt like we were in good hands. Janet T.